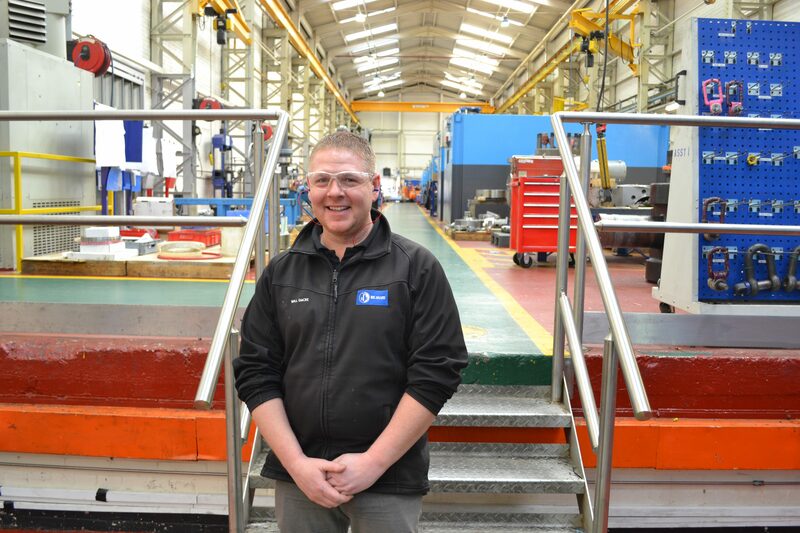 Will Dacre, Assembly and Test Manager at BEL Valves, tells us about his learning journey. From starting out as an apprentice to becoming a department manager. When did you start working for British Engines? I started working for British Engines as a 16 year old apprentice in 1996. My uncle was the one who told me about the company and insisted I applied. British Engines is well known in the North East and I was very excited to be accepted. Tell us about your apprenticeship? I was in a group of 11 and we studied at the training school for one year before starting on the shop floor at BEL Valves. I started on the centre lathe with my mentor Hilton – he’s actually still working for the company now! I then worked my way around the shop floor to gain as much experience as I could on several different machines such as: manual milling machine, CNC machine and the horizontal boring machine. What advice would you give to an apprentice starting out? Write down everything you learn! I still have books that I refer to now from when I was an apprentice in training. I will always ask the apprentices on the shop floor to get their books out and take notes if they are learning something. It’s the best way to make sure you take everything in and remember it. Tell us about your job progression and roles within the company? When I came out of my time as an apprentice, I was mostly doing nightshift which started at 21:45 and finished at 07:30, I preferred these hours at the time because it fitted in well with my family life. After a few years, I became team leader working on the Mazatrol Integrex machine which is a milling and turning machine worth over £750,000. Around eight years ago I decided to go into Production Engineering. This meant spending time in a different machine shop and gradually beginning to work in the offices. It also meant that I had to do some further EdgeCAM training where I progressed from level 2 to level 5. I worked closely with the Bangalore office; I would visit India to share best practice methods of programming for their CNC machines. I enjoyed working in India as it was somewhere I would never have had the chance to visit if it wasn’t for my job at BEL Valves. I then started to help out in the assembly and test department. When a position came up for the Assembly and Test Manager, I applied and I got the job! I have been in my role for one year now which has been a big change for me. I manage all assembly and testing in the factory; it definitely keeps me on my toes! Probably coming out of my time as an apprentice. I was so proud I had finished and was fully qualified to do my job. What made it even better was that it was with British Engines, they are seen as one of the most well-established and successful businesses in the North East. I enjoy interacting with the guys within the department and on the shop floor. It’s the people here that make it for me. Finding enough time to do the things I need to do on a day to day basis! Today I’ve had a meeting from 11:30 – 12:30 then another from 13:00 – 14:30 which means I have less time to do the things my job requires me to do. It gets a little stressful but makes the day go extremely fast. What do you hope to achieve in the next 10 years? I hope to become a better manager and to be able to lead my team successfully. I hope to do this by learning from my peers and gaining as much experience as I can along the way.